When I first met Mr. MemphisWeaver, one of the things I remember him saying was “Man plans, God laughs”. This from a well known Yiddish proverb, Mann traoch, Gott Lauch. We’re all laughing now, because at that moment we weren’t planning on marrying and being together for at least 26 years. But it’s true. Yes, it’s true. 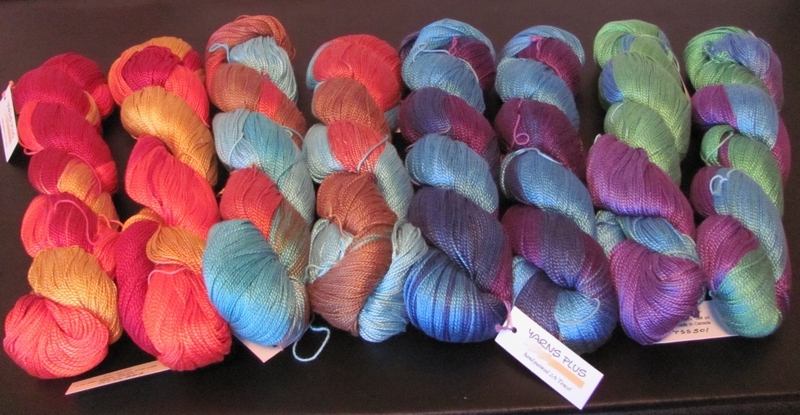 And now I am planning ahead for some projects that will keep me busy for awhile. Short term are two art and fine craft fairs where I will be selling my handwoven scarves, accessories and handbound books. One is happening this weekend, February 20 at the Hutchison School in Memphis. The second show will be at Christian Brothers University in Memphis the last weekend in March (26-28). Some of the items that I have been working on to include in these shows are handwoven scarves woven with bamboo, cotton and ribbon yarns, and also a series of handbound books made with hand made paper. 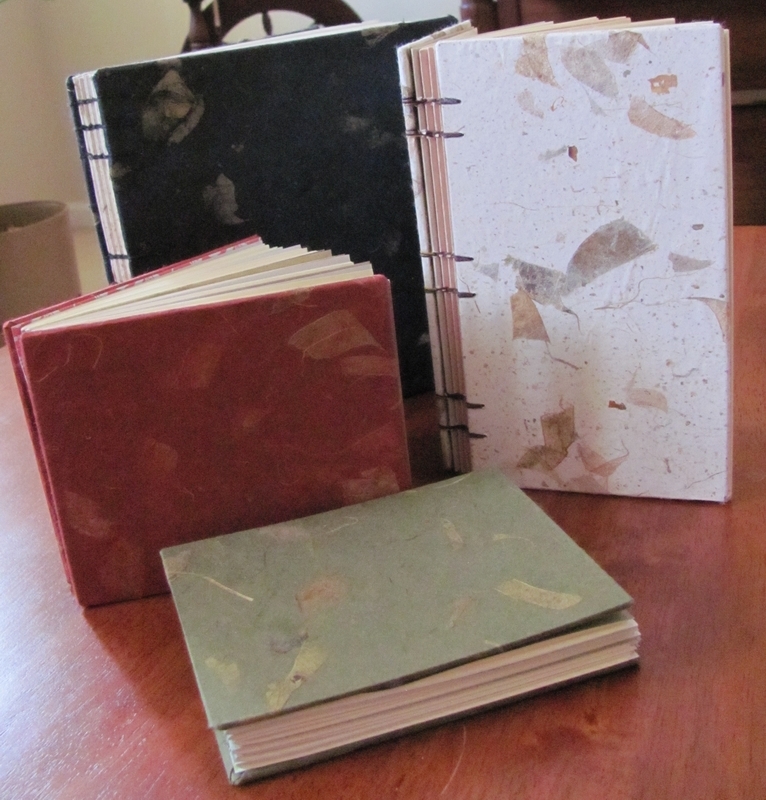 The book bindings are varied ranging from herringbone, coptic and long stitch. The long term projects I will be working on are the eight ceremonial prayer shawls that I will be weaving by commission for a large synagogue. 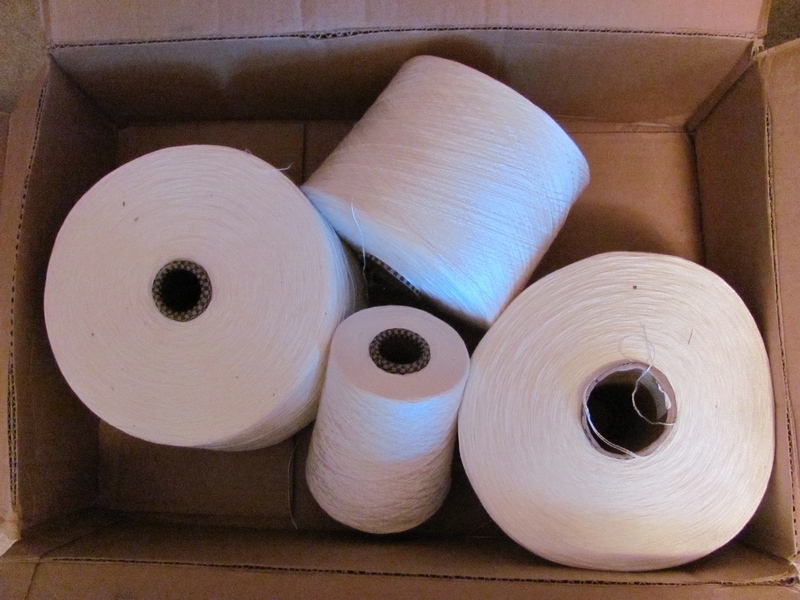 The shipments of yarns required for this project recently arrived, and I will be warping my looms as soon as my production for the art/craft fairs has calmed down. The warp for this project will be 8/2 undyed natural tencel yarn from Webs. The background weft will be the 8/2 tencel, and the pattern weft will be Bambu 7 from Silk City Fibers and a luscious hand painted 5/2 tencel from Yarns Plus. The friendly folks at Yarns Plus were especially helpful in guiding me in the preparation of the hand painted tencel, particularly in light of the fact that I will be weaving it with undyed tencel. I’ve wrapped the yarn and color sequence around a foam board as a way of planning the pattern design. You Transylvanians are probably getting ready to do the time warp again. And though I’ve waited in an endless line in a raincoat to see “Rocky Horror Picture Show” and thrown toast at the movie screen, this is a slightly different time warp. In fact it really doesn’t involve time transference except that it does take a bit of time to put a warp on a loom. 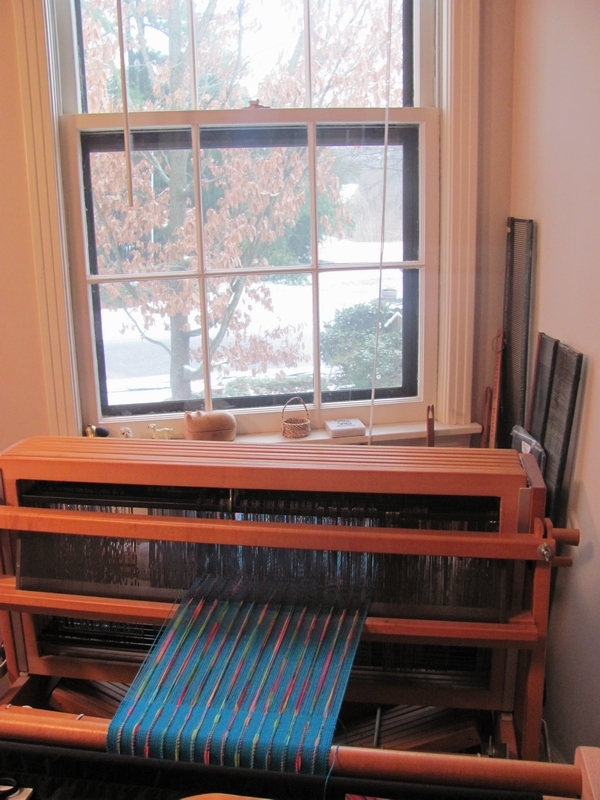 Deborah Chandler defines “warp” as this: the yarn attached to the loom such as the warp yarns of cotton and ribbon tied to the front of a floor loom pictured above. The warp is always kept under tension during the weaving process. 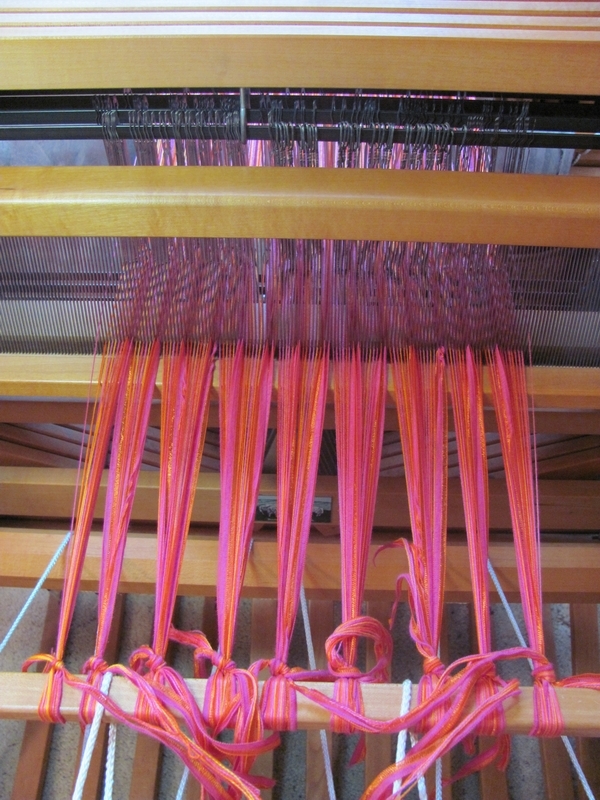 The “weft”, Chandler continues is the cross threads that are woven over and under the warp threads. “Warp” and “weft” are the essential ingredients of a handwoven product. Not all looms need to be floor looms like the one pictured. 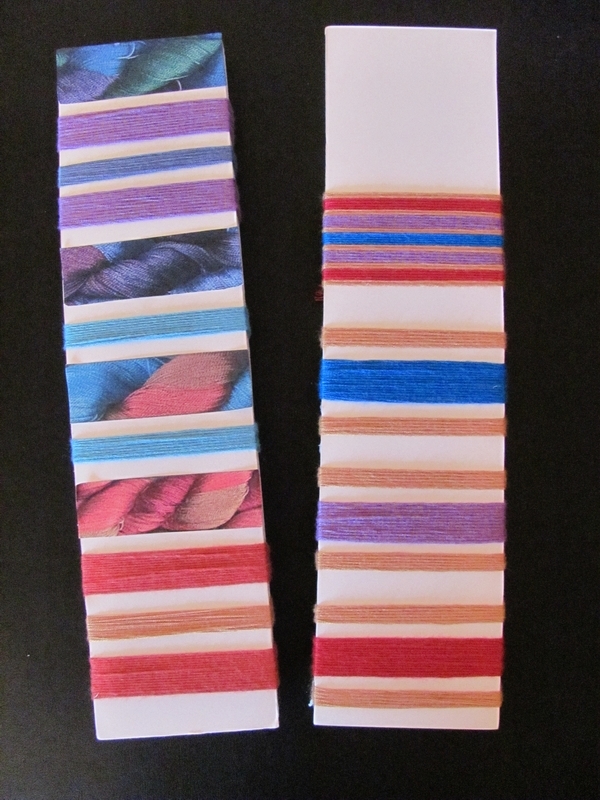 Here are some simple wood and cardboard looms. All of them are capable of holding a tight warp. 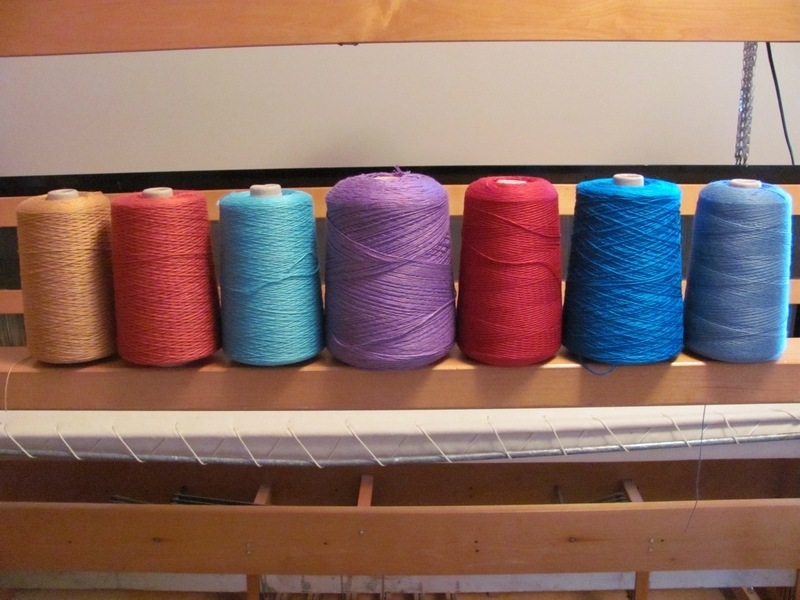 The loom on the left is a small sample loom for needle weaving. The loom on the right is a potholder loom just like the plastic or metal ones we all seemed to have as children. Above are cardboard looms cut from mat board. They are notched at either end and then threaded with a warp of Peaches and Cream cotton yarn. 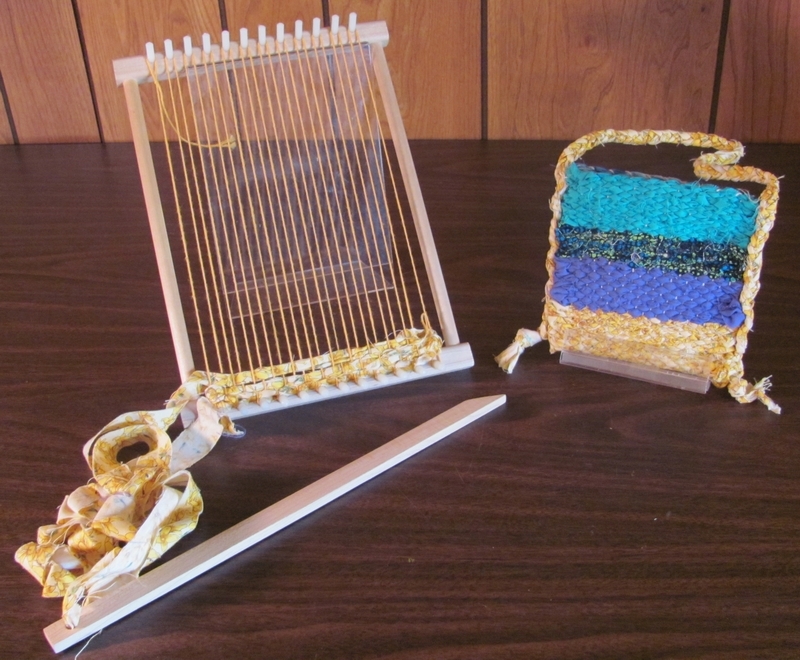 The two purses are examples of products that can be woven on a cardboard loom. 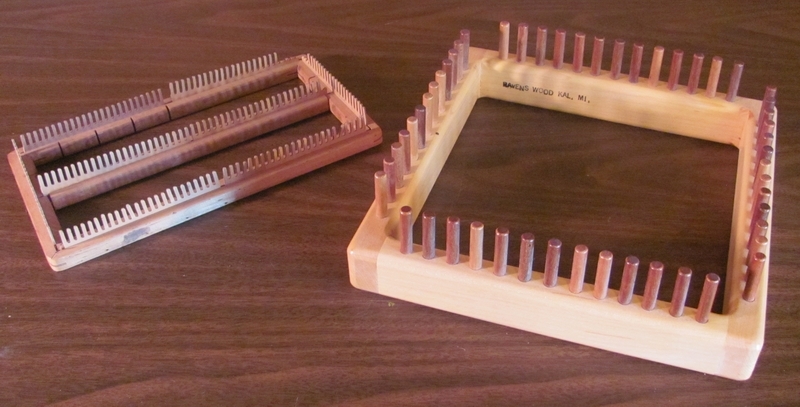 Here is a peg loom made by Harrisville Designs. 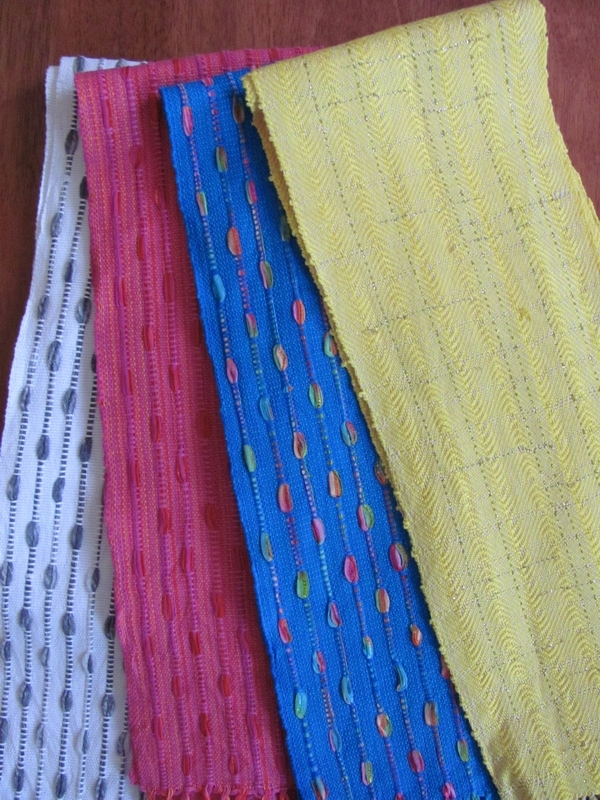 The wooden needle is used to weave in the weft, in this case fabric or “rag” strips. 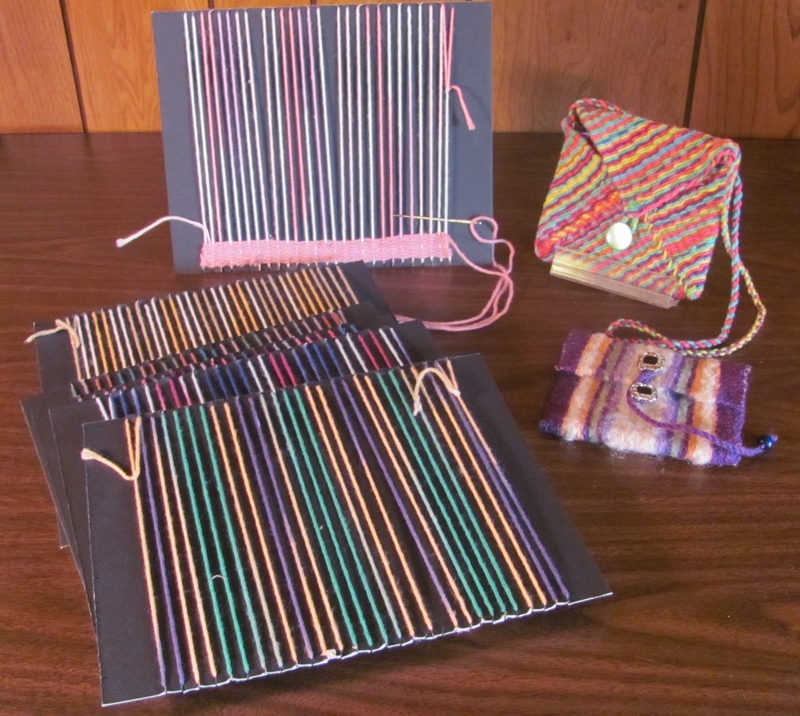 The rag purse with braided handle is an example of what can be woven on the peg loom. Now here is my gripe, other than the one when “loom” is used the wrong way. If you have ever typed “handwoven” in the search box of an online retail site such as Etsy, you will find many items, most of them lovely. However, not all have a warp and a weft which is the hallmark of a truly handwoven item. Some are knitted, some are crocheted, some are braided. Keep in mind that these items are made with sticks, sometimes one, sometimes two. They are not created on a loom, and they do not have a warp and a weft. Let me just say, “Buyer beware”. When you want to purchase a handwoven item, be sure it has a warp and a weft. This means that it was woven on a loom – any kind of loom, from simple to complex. Weaving is a unique process – it is not knitting, crocheting, quilting, or embroidery although there are people who mistakenly believe so. As for me, I am lucky to have a loom (several of them in fact) of my own. And mine comes with a view.